Today I'm doing a review on a nailpolish by O.P.I. I bought this at Sephora on my trip to France a while ago, I've always wanted to try out a nailpolish by O.P.I since I've heard a lot of good reviews about it. 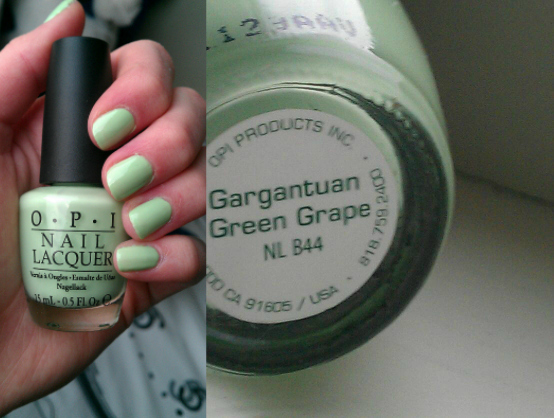 So I decided to buy this pretty spring/summer color in the color 'Gargantuan Green Grape'. I've been wearing it quite often because I love the color! If you use a base + top coat this nailpolish will remain chip-less on your nails (for about 2-3 days). The first layer is quite streaky but when you apply one or two more coats it's perfect. The brush is really nice since it's flat and a bit bigger than your usual nailpolish. Welcome to my blog! This is where I write about my passion for beauty and make-up. Feel free to follow and leave me a comment! Copyright 2012 - Layout by | www.portfoliomydesign.tk |. Picture Window theme. Powered by Blogger.